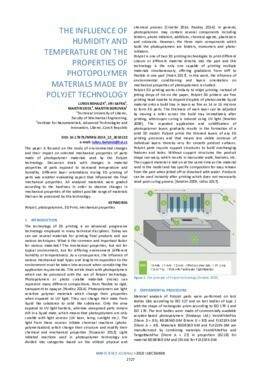 The paper is focused on the study of environmental changes and their impact on selected mechanical properties of parts made of photopolymer materials used by the PolyJet technology. Discussion deals with changes in material properties of parts exposed to increased temperature and humidity. Different layer orientations during 3D printing of parts was another evaluating aspect that influenced the final mechanical properties. All analysed materials were graded according to the hardness in order to observe changes in mechanical properties of the widest possible range of materials that can be processed by this technology.